On June 4, employees of the Royal Cliff Hotels Group took part in the “Seven Billion Dreams. One Planet. 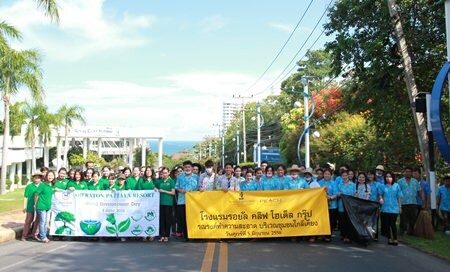 Consume with Care” campaign organized by Pattaya City Hall at Jomtien Beach, to commemorate World Environment Day 2015. Deputy Mayor Wutisak Rermkitkarn and City Councilor Chusak Sriwatchanapong welcomed volunteers to the event before they released fish into the ocean, followed by a cleanup of Jomtien Beach. On the same day, another group of 20 employees from the Royal Cliff also joined neighboring properties in cleaning the beaches and surrounding areas of Pratamnak Hill. Employees of the Royal Cliff Hotels Group took part in the “Seven Billion Dreams. One Planet. Consume with Care” activity organized by city hall on World Environment Day 2015. Previous articleDengue Fever – worse than MERS or SARS?